Casio PX-160 is one of many keyboard pianos produced by Casio in recent years. It’s an affordable and portable digital piano from the Privia line and the successor of the PX-150 model. The PX-160 inherits many features from its predecessor. To begin with, it comes with the famous Casio Multi-Dimensional Air Sound Source and the tri-sensor scaled Hammer action II. Even better, the model has gone a step further to improve some of the weak sides of its predecessor and added some great features that you can enjoy. Let’s take a closer look at the PX-160 in-depth review below. Casio PX-160 is a lightweight and compact digital piano. It weighs around 25 lbs without stand with a width of 52 and 11.5 inches deep. This is quite standard for full range piano especially when you consider the 88 hammer action keys and most of its features as you will see in this Casio PX-160 review. It is very portable with its size allowing you to take to gigs and practice hall. It’s compact enough to fit a small space as you can even place it on a table. The build quality of the piano is great. Even though it’s made of plastic, the material feels nice to touch and is of decent quality. Note: Use a bag or a casing during transportation to prevent the piano from breakage. The control panel is easy to navigate. Here, you’ll find dedicated buttons for common settings and functions. If you are looking for additional features, you might need to access them by pressing the labeled keys and holding the function button. This might be challenging for some people, but it’s a great way to avoid overcrowding and simplify the control panel. The PX-160 comes in 3 different colors – white, black and gold – that are not too flashy, but looks fresh and contemporary. Normally, it does not include a stand on the purchase, but you can choose from several available options on the market. 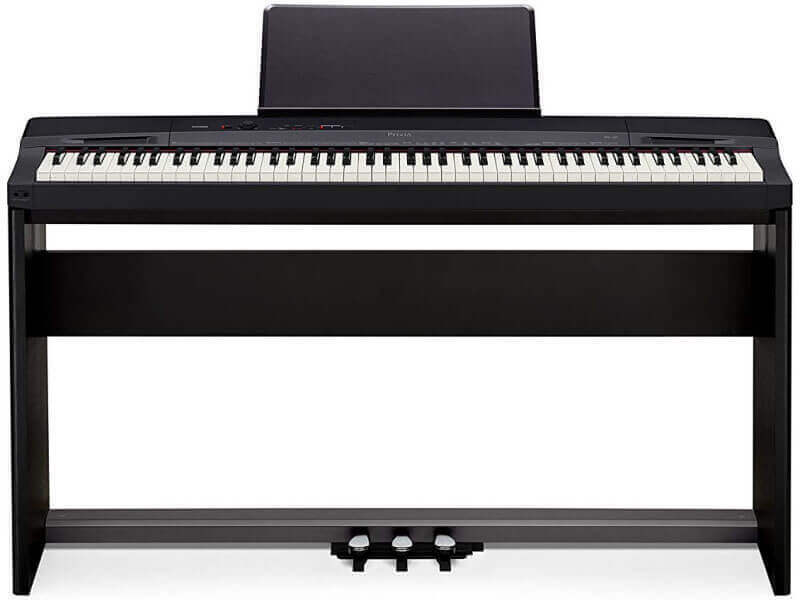 The PX-160 features a fully weighted keyboard with 88 full-size keys. It incorporates the famous Casio Tri-Sensor Scaled Hammer Action II that ensures you are getting a realistic response from the keys. It features actual hammers that stimulate the hammer action giving it the feel of an acoustic piano. This alone makes it a top contender for the best weighted keyboard in its price range. The keys are made of plastic, but they have ebony and ivory finish that gives you an excellent grip and prevent your fingers from slipping when playing. The keys are velocity sensitive (features triple sensor), so the volume and timbre changes depending on how strong or soft you press the keys. The keyboard is also graded meaning it’s lighter on the higher register and heavy at the lower register. The piano sound is one of the great features the instrument has to offer. It comes with five grand piano sounds sampled from a high-quality grand piano. Each tone has different timbre, so it’s easy to pick the one that suits you most. Even better, you can further the sounds by customizing them with different sound effects. On this, you’ll find a reverb effect that makes the notes resonate more. There’s chorus effect that makes the sound richer and louder as if there are two different instruments playing at once. There’s brilliance which makes the instrument sound softer and mellower or harder and brighter. As stated at the beginning of this review, the PX-160 features the Casio’s Multi-Dimensional Morphing Air Sound Source. The sound source uses lossless audio comprehension, therefore, the sound produced has no distortion. Its memory capacity to store sampled sound has increased three times from the previous version, so the sound produced is of higher quality. The PX-160 comes with 128-note polyphony that enables you to play notes without being cut off. The polyphony is enough to play even classical music and many other musical pieces. You can even play along with your recordings and have no issue of notes cutoffs. If you have used the PX-150 (the PX-160 predecessor) or seen in many of its reviews (for example, our PX-150 review), you might have an issue with the weak sub quality speakers. This, however, is history in the PX-160. It comes with two built-in speakers which give 8W + 8W amp giving a clear and detailed sound that is very satisfying. The speakers are loud enough to play comfortably in small and medium space without the need for an amplifier. If you need the best sound to catch every nuance on your performances, you should look for a pair of quality headphones. The PX-160 does not come with many fancy features and add-ons for music performance and production. But it comes with all the essential features to give you a good playing experience. The PX-160 comes with three mode features that you can use. First is the split mode that allows you to layer two instrument sounds (Bass which will be assigned on the left and any other sound on right). There’s Dual Mode, which allows you to layer two different sounds and play them at the same time. And lastly, the Duo mode that splits the keyboard into two identical parts allowing people to play together in the same pitch at the same time. The piano also comes with a few other functions that allow you to adjust the keyboard pitch to match that of another instrument or vocalist. It comes with the transpose function that helps to raise or lower the pitch of the entire keyboard. It also features the octave shift that changes the octave pitch in the keyboard. And the fine-tuning function that enables you to raise or lower the keyboard pitch in 0.1 Hz. The PX-160 comes with two headphones jack ports which enables you to connect two pairs of headphones simultaneously. There’s a USB port that enables you to connect directly to your computer with an A-B USB cable. Even better, you don’t need to install any drivers for you to use it on your computer thanks to plugging and play technology. On top of that, you’ll find Line out jack which you can use to connect the piano to an external speaker system. There’s also sustain pedal jack that you can use to plug in SP-3 pedal or any other pedal with ¼ plug jack. The PX-160 is an impressive digital piano. It comes with quality build and features at a fraction of the cost of its competitors. It’s, no doubt, one of the best digital pianos under $500. It’s constructed brilliantly and has an authentic sound with comfortable and playable feel. It comes together to give everything a beginner can need to take their skills to the next level. Overall, the Casio PX-160 is a great option for money and a perfect instrument to practice and travel with.